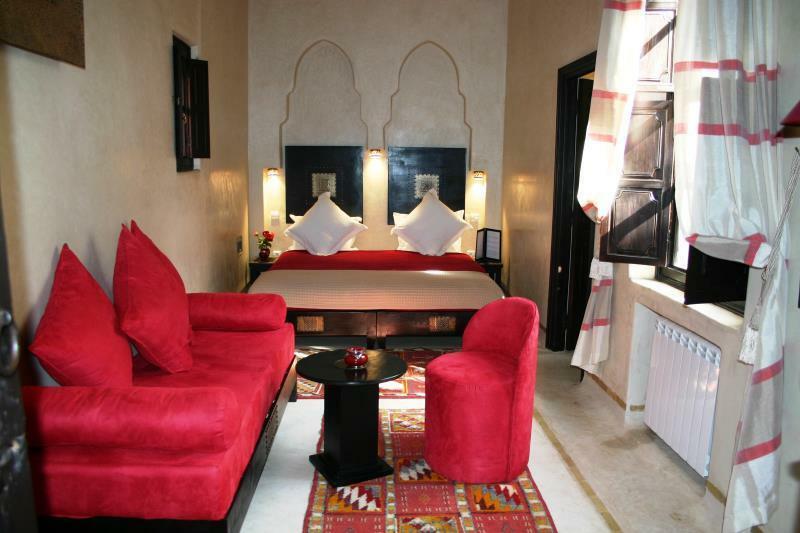 ﻿ Riad Diana Marrakech. JIMAT di Agoda.com! Ada soalan mengenai Riad Diana? Terletak di tengah-tengah Medina, Riad Diana merupakan tempat yang sesuai untuk meneroka Marrakech. Pusat bandar hanya 1 KM jauhnya dan boleh sampai ke lapangan terbang dalam tempoh 15 minit. Bagi anda yang ingin pergi agak jauh, Pawagam Eden, Beldi Weave, Guide Marrakech Amghar merupakan beberapa daya tarikan untuk pelawat. Kemudahan dan perkhidmatan yang disediakan oleh Riad Diana memastikan penginapan yang menyenangkan bagi para tetamu. Tetamu hotel boleh menikmati kemudahan seperti khidmat bilik 24 jam, Wi-Fi percuma semua bilik, pengawal keselamatan 24 jam, pengemasan harian, khidmat pos. Masuklah ke salah satu dari 5 bilik tetamu kami dan tenangkan hati anda dengan pelbagai kemudahan seperti internet wayarles, internet wayarles (percuma), bilik larangan merokok, penyaman udara, pemanas yang boleh didapati di beberapa bilik terpilih. Senarai lengkap kemudahan rekreasi boleh didapati di hotel, termasuk sauna, kolam renang tertutup, spa, rumah urut, bilik wap. Riad Diana merupakan tempat yang ideal bagi penginapan pelancong yang mencari keindahan, keselesaan dan kemudahan di Marrakech. Nice location! The house locates at a quiet and small lane in medina. Near the parking and easy to access with google map. It's less than 10min to Jemma el-Fna by walk. Room is not big but very neat and lovely. Staffs are friendly and helpful. We checked out very early, but they still prepared breakfast for us. We would like to have dinner here next time. The food looks good, but unfortunately, we missed. It will be better if they can give us some local public transportation information. I asked which bus we can take to new city and Jardin Majorelle, the staff told me no bus, we can take taxi. But we found a bus near Mosque. We had a lovely stay at this quiet, friendly, well positioned Riad with a great cookery class from Aziza. All the friendly staff made our trip very enjoyable and were exceptionally helpful towards our 11-year old son. Recommend the Hammam for the whole family. The trips out of town were well worth doing if you want a holiday with variety - we skied for one day, did a short trek in the Atlas mountains and spent a day at the beach in Essaouira. Many thanks to the great team! 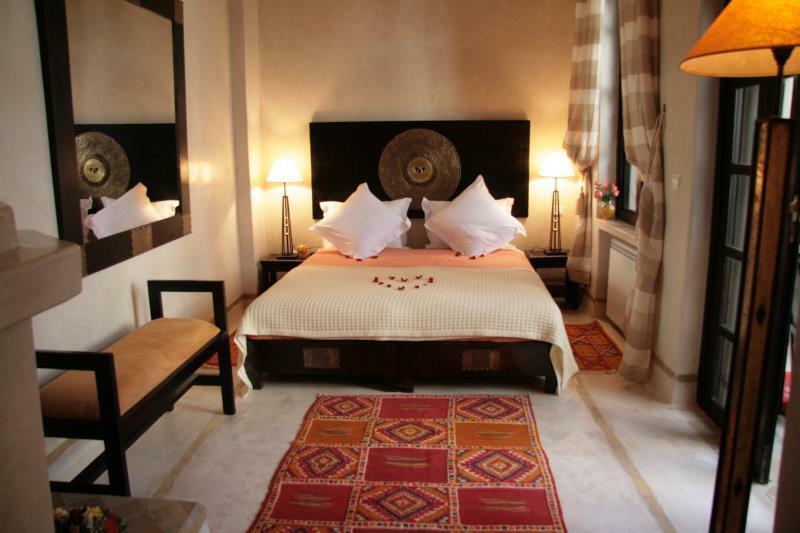 It is very close to old town for shopping, you can buy everything around this riad. However, be prepared to get lost in the small street in the world heritage Medina. The staff and the manager are very friendly and helpful. They are always willing to help that make you feel home. Try the hamman and massage there. It should be a great experience. 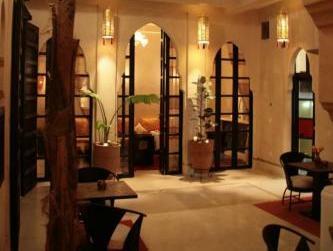 I stayed at Riad Diana after an 18 day tour of North and South Morocco. I was after some rest and relaxation and I was not disappointed. From the hammam and massage to the cooking class I was superbly looked after and given a real taste of Moroccan hospitality. affordable, friendly/helpful staffs, right in the old medina, very close to the main square. We really enjoyed our stay. It was too short, but definitely memorable. The best things about the riad, was its position, easy to walk to all the attractions, and in the centre of it all. Very quiet and relaxing in the riad. Beautiful rooms, and attentive helpful staff. We went ion August, and it was even hotter than usual, 45 degrees, which was a little too hot to go out in the afternoon. The riad had a plunge pool, which was lovely to cool down in, it also has a lovely roof terrace, which has a good view across the city roofs. The food cooked here is excellent, they also do cooking courses, but it was too hot when we went to contemplate cooking in the heat. The staff will organise day trips to other places, like the mountains, if you want. It is part of a group of 3 riads, people can from the others form the haman and massage, which i heard was very good. the manicure was ell worth it. Breakfast was lovely, plenty to eat. Although close to everything, taxis can not get to most raids in the medina, and it can be a little confusing at first, so getting the riad to send a taxi & who will then get a man with a barrow to take you would be easier, as we got a little lost, someone sent us the wrong way, but a lovely man brought us back, but I could have done without it in 44 degrees. Shop keepers do hassle you, but are fine if you just say 'non merci', you can look without buying too, as they are very good natured if you don't want to purchase, but will then often give you a very good price if they think you are leaving. We found 4 days plenty in the centre, then went to les maison des oliviers, which is just outside the town, which is gorgeous, with a pool, to relax for a couple of days before we came home. We all enjoyed the experience, the hassle & bustle and heat, especially our teenage daughter. I would go back here again, at a cooler time of year, loved it. A great experience of shopping and culture. Provided a safe haven in a chaotic and frenzied environment. We only stayed a night as we were going off for a desert tour early the next morning. We were served by a friendly receptionist who brought us mint tea and cookies even though we arrived at the hotel past midnight. He was very friendly but had a limited command of English. The rooms were nicely decorated but was small (typical standard for marrakech I guess) and some areas of the room was slightly dusty. But overall, it was a good hotel to stay in! I had a good time in this Riad. maneger came to my room for greeting and gave me welcome gift which is pretty bracelet. bed is very comfortable. I slept well. breakfust is fine. WE arrived a bit tired and stressed from our train trip to this beautiful little oasis only minutes from the madness of the Medina. Our room was ready with rose petals delicately scattered across the bed and bathroom. How beautiful! We were warmly welcomed with mint tea & asked if there was anything we needed. As it was our first night in Marrakech we asked if we could eat at the riad that night. What an amazing experience! A romantic rooftop dining setting at sunset with the best meal we ate anywhere in Morocco. Exquisite! The service and friendliness of the staff is unequalled (& we have travelled extensively) and the facilities were exceptionally clean and comfortable. I would gladly stay again and give it the highest recommendation. Thank you for a wonderfully warm experience! 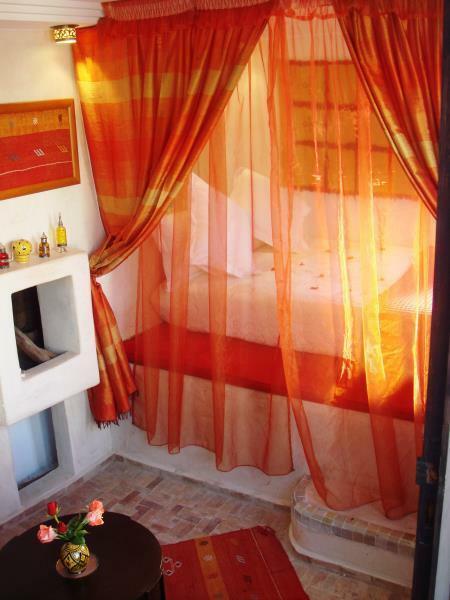 We felt very welcome in this riad and the staff were kind and helpful. The staff serve breakfast every morning and there is a lovely roof terrace with sun and shade. We were also centrally located. Really a home from home with attentive care from all the staff. Almost everywhere you want to go is within walking distance including many restaurants. Everything worked perfectly, from the airport pick-up, transfer from taxi to hotel (essential and readily arranged). Booking of trips and excursions to simple needs of tea and coffee at any time are perfectly accommodated. Highly recommended for a short or long break in Marrakech, hopefully we will return. Lokasi hotel terletak di tengah pasar sehingga agak menyulitkan jika harus membawa barang banyak karena tidak bisa parkir di depan hotel langsung. Namun buat anda yang ingin mencari pengalaman baru yang berbeda dari biasanya, hotel ini menjadi pilihan tepat. Kita bisa menikmati suasana marrakech asli seperti di perumahan penduduk asli maroko pada umumnya. Sarapan yang menarik, kondisi kamar yang bersih serta staf yang ramah membuat kami merasa betah dan pastinya akan kembali ke hotel ini lagi. Hotel in optimaler, zentraler Lage mit seht hilfsbereitem und freundlichem Personal. Eine Oase der Ruhe im Getümmel der Großstadt. Wir kommen gerne wieder.